WORD OF WARNING: Yasaka Shining Dragon Sponge is BRITTLE AS HECK ! Very very brittle sponge !!! If you are going to cut it, please use a very very ultra sharp blade and go over the sponge MANY MANY times GENTLY ! Keep scoring the sponge until you get through to the topsheet and only then do a FINAL PASS of cutting the topsheet in one clean firm continuous fluid motion. In case no one noticed, the Yasaka Logo and text on the red rubber is NOT PERFECTLY CENTERED so if you tend to stick rubbers based on the Rubber logo you will have an offset cut which is what happened to me for the first time. Yasaka Shining Dragon has the same slight tackiness similar to Yasaka Rising Dragon. Barely lifts the ball for 1 second. Rubber topsheet is very grippy. 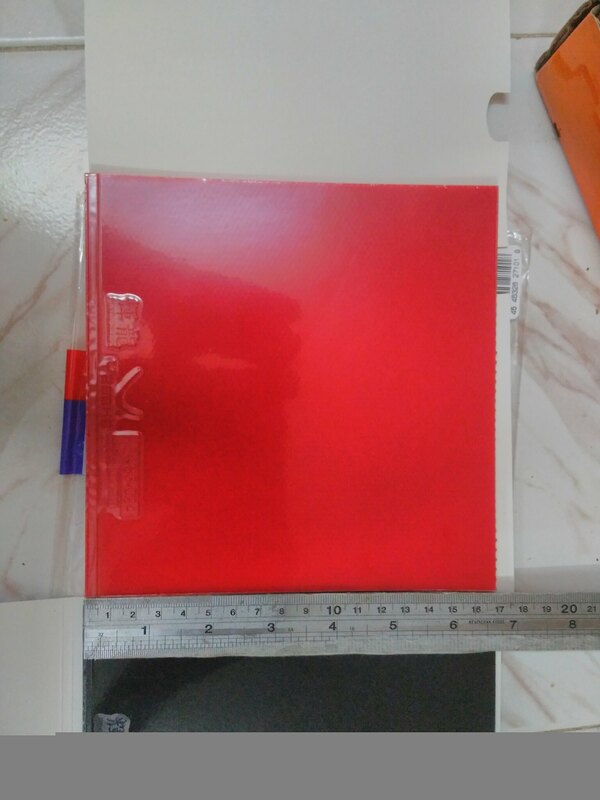 Both Black and Red topsheets show similar properties. YSD sponge is definitely harder than YRD. Black rubber with blue sponge and Red rubber with red/peach sponge. Both Red and Black sponge feel the same. Update 1: I had about 1 hour hit practice with this rubber. YSD is definitely slower than YRD. Even though the YSD sponge "felt" softer when squeezing between the fingers, YSD sponge just feels like a harder sponge when playing. YSD is a traditional Chinese classic rubber. Hard feel, slow spinny rubber, good for short push game, long loop-counterloop rally etc. I almost felt like I was playing with an unboosted H3 Neo rubber! Though the tack is not at all anywhere near H3N, the topsheet is very grippy. You can get a very consistent brush loop going and this rubber I would think is as spinny as an unboosted H3N. 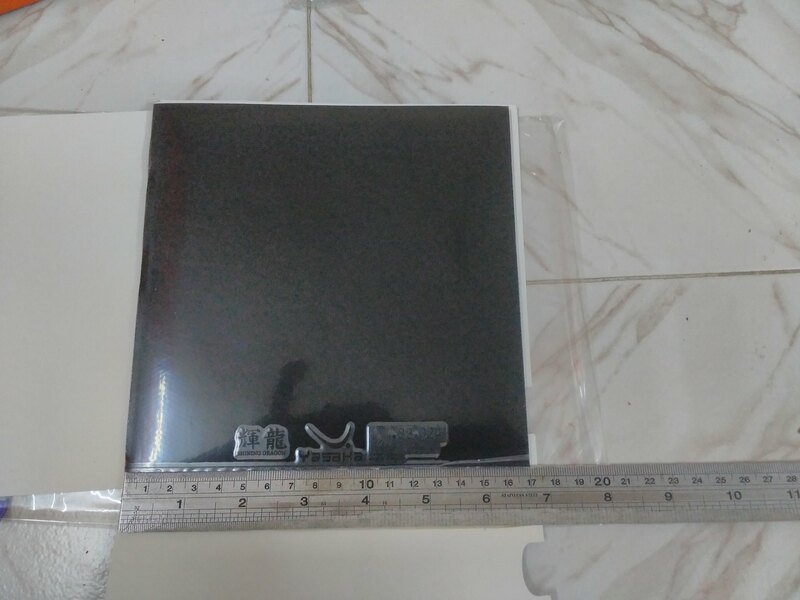 So YSD Red rubber and YSD Black rubber both have the same characteristics of a classic Chinese rubber like H3N. YSD serves are moderately spinny and you can keep the ball really low and short. Blocks are good but YSD is more medium throw rubber. If you keep a neutral bat angle the block will just barely clear the net in comparison YRD is a low-throw rubber and requires either you block the ball just on the bounce or a much more open bat angle to block against topspin to just clear the net. Im having mixed feeling about it now. 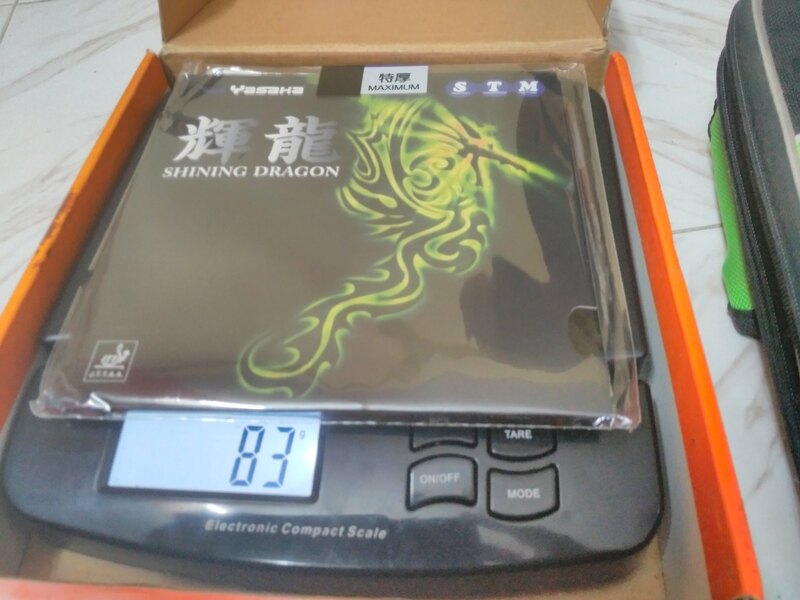 The Yasaka Shining Dragon doesn't seem to shine as a classic Chinese rubber. Its not sure-tacky or super-spinny or super-fast or "catapult-y" or weird throw or super-heavy or super-lightweight. Where is the "shine" in this dragon ? Perhaps Yasaka's famous QC ? YSD for the classic Chinese type players. Only thing that is left to try is Falco on these rubbers. The blue-sponge for black and peach-rose sponge for red reminds me so much of the dubious 729 SuperFX rubber sheets I recently bought that turned out to be non-tacky SuperFX ! Unlike the YRD Carbo-sponge, the YSD sponge should be boostable especially considering how brittle it is ! The YSD sponge is a flake monster, just like how Palio Thor's yellow sponge is horribly brittle and hard. I would be very very cautious playing over the table surface and near the edges. Hit the rubber anywhere on the table and you are going to be crying from the damage. Thick foam edge tape covering all the way to the very edge of the rubber topsheet is highly recommended. I haven't observed any difference between YRD topsheet and YSD topsheet. Phyiscal appearance seems to differ only in the sponge. I will continue to test it and update if there is any significant findings. Overall I am very happy with the performance of YSD as I was really expecting the classic Chinese feel from it. YRD is still the rubber that works perfectly for my game. YSD will work better for me once I start getting more into a power game and need to sustain long rallies. Right now I don't have the full strength needed to use and exploit the YSD rubber properly throughout an entire play session. So from the perspective of someone who uses Hurricane 3 Neo, is there a reason to switch to Shining Dragon? I was hoping for a rubber that plays the same as H3N, but with more speed. Is that the case? Which rubber is more similar to boosted H3N, Shining Dragon or Rising Dragon? Millions of Chinese TT fans have been looking for an alternative to boosted H3N. But no avail for years. Again, YSD and YRD have disappointed performance in Chinese forums. I guess time will tell. One day one of the brands will magically combine a Tenergy-like sponge with a Hurricane topsheet. YSD isn't as tacky as H3N. YSD is a very different from H3N when comparing head-to-head. For example, H3N has a medium-high to high throw-angle. YSD is only medium and could be even medium-low throw when compared to H3N. YSD is probably just slightly faster but H3N has all that tack so if you compare a new YSD to a very old H3N ... it could be same speed despite different tackiness !!! I think YSD is lighter than H3N ? And the sponge hardness is NO WHERE near H3N. YSD Sponge is not springy and not catapulty. 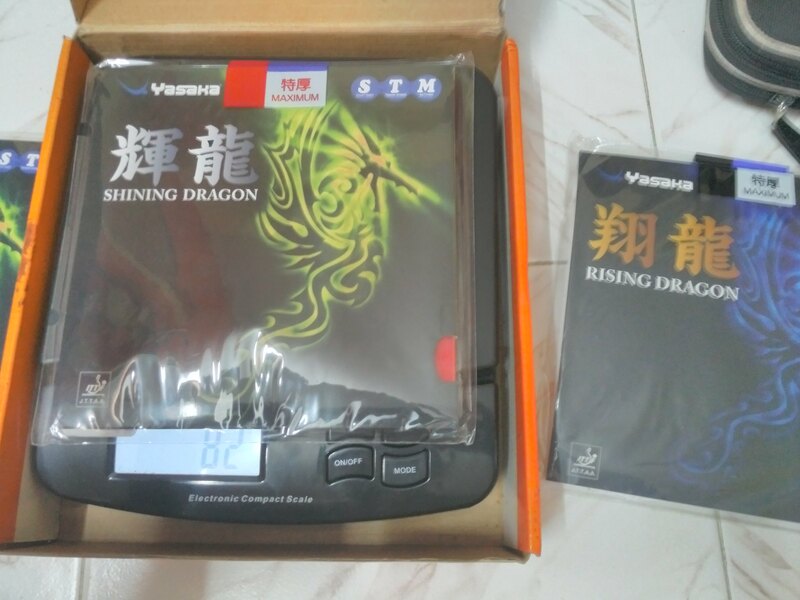 Yasaka Shining Dragon is a classic Chinese rubber version of Yasaka Rising Dragon. What I love about both rubbers is the No.1 Quality control that Yasaka has done on these rubbers! And the superb controllable play but not passive play that is possible. YRD is for players transitioning from Euro-rubber / Euro-style play to a more Chinese-rubber/Chinese-style play. YSD is for players just wanting a Chinese rubber that doesn't need boosting and doesn't kill their game or require tons of muscularly developed strokes. So why, exactly, are you weighing the rubber in its packaging? Shall we say I was too excited to get the rubber out ? and also I was soooo excited I glued it up and cut it before I realised I had not weighed the sheets without the wrappers ! YSD requires a ton of power and spin from me. I can't last more than 1 hour of solid play / drills. YRD isn't as tough to use as YSD but it doesn't have the same "features"
YSD requires a ton of power and spin from me. I can't last more than 1 hour of solid play / drills. Are you saying that it requires a lot of effort like Hurricane 3? Heh, tensors (on forehand) are for lazy people . Although, after an hour of training with Chinese coaches I basically try my best not to collapse and die from intense footwork drills. Also I'm wondering how YRD/YSD compare to Stiga Genesis since they are both Chinese hybrid rubbers. Have you tried Genesis yet? Yes. Unlike Tensor rubbers, Chinese rubbers do need a lot of effort to get them working. And that is not even considering the movement needed. Your shoulders, hips, thighs, forearm, wrists, fingers and entire body feels the pain of the extra effort. The same effort with Tensors doesn't work the same way. Tensors for me give almost no contact feeling, no brushing sensation and feels plain weird. Stiga Genesis ? nope. I am not likely to try Stiga rubbers, last time I tried Calibra LT plus that one of my friends had and didn't like it. Problem is I moved to all Chinese rubbers, so I swing harder, hit harder, or touch almost too gently for the same kind of strokes to work well with Tensors. Stiga / Tibhar / Joola / Butterfly / Donic they all are making rubbers that are too catapult-y. Too fast for me now. My preferred Euro-style rubber now would be 729 Focus+snipe III or 729-5 or MarkV. So all these Maxxx450 or Blue-something M/F/S/P or Mantra/Genesis or Hybrid-K I feel will be too fast. So not going to try them. I request other forum members who might have tried the Genesis to compare please. I do have an old sheet of Andro Rasant and TIbhar 5Q Sound and perhaps Joola Rhyzm somewhere. YSD === one word === classic Chinese -----> nowhere as fast or even spinny unless you swing very hard. So even though YSD might seem to match the speed and spin capabilities of H3N it is from different properties. Update: YSD after what now more than 1 year? I took it off the blade and it is has a HUGE reverse dome or dish now. Looks like YSD is a typical Chinese rubber for reverse dome.Funnily it still plays like normal for me. There has to be some mistake or strange thing going on here. 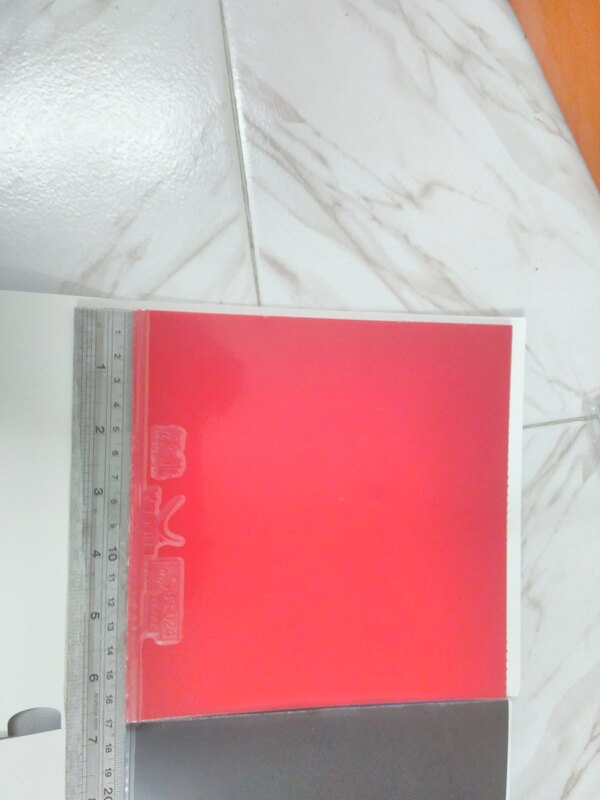 YSD I will finally boost to get it flat shape. But weird that it plays same even when reverse domed. Can someone attempt to explain if this is possible ? Edit: The unboosted YSD plays same whether it is flat or reverse-domed. But the BOOSTED YSD has a medium-high throw angle ! And the speed is roughly about 20% more. The slight tackiness hasn't worn off and the boosted YSD rubber really really shines for me. Talk about able to flick anything! FH or RPB BH flicks are almost magical for me to do. I only applied enough booster to get the rubber completely flat. I really don't need a much faster or too soft of a rubber since the YSD fits with my game. Update 2: I boosted the old YSD sheet with 5 layers of Falco booster and now there is a bubble in the middle of the rubber I guess YSD shouldn't be boosted more than to get it flat and on the blade for sticking. Also the boosting hasn't really changed properties beyond the ordinary. It behaves as I have experienced before despite the heavy boosting. Last edited by man_iii on 16 Apr 2018, 13:23, edited 1 time in total. I have a DHS Power-G9 blade. I will try to take time to glue the YSD on that and get back on the results. Note since I am currently using the YSD actively and I have to search for the PG9 blade from my TT stuff pile, it might be several weeks I hope someone else can review sooner than me. man iii its very interesting the battle 1 sponge crimson rose color also behaves same when u take it out from the blade it goes into a reverse dome and also is very fragile,i just grazed the edge of blade while playing not even firm touch to the table and have a 1/2 cm cut at the tip of the blade.Unsure whether yasaka borrowed this sponge from them or is it a common distributor for both of them also its hardness is around 5.5/10.By the way i sold my both balsa blades and some yasaka rakza 7 soft rubbers,am eagerly awaiting ur evaluation.Also how good is it on bh compared to rakza 7.I think my ideal blade weight is 180 to 185 gm with less pain on elbow.Currently am sticking with YMLSC with 729 08 on fh and battle 1 on bh.I may try calderanos blade which is way lighter its only 83 to 85 gm.foco off+. I think it "feels" like a Chinese rubber but maybe just faster. I have played with Faster Friendship on a fast bat and both Dragons feel faster than that, but less spinny. I did find that looping the ball was going long at first and I had to adjust. I assume it is due to the rubber, but I honestly can't tell you how fast the Falcon is in comparison to today's bats, as it is so old and no one seems to know anything about it. I do know both the Dragon rubbers flick like crazy and I love the way Shining chops/pushes. My strategy is to try to push deep to the back hand corner and loop off of the return if I can get in position, so having my push work is important to me and these are very controllable and provide good spin. You do have to use a full arm swing through the ball to get speed out of them when hitting flat, but they offer good control that way in return for your effort. My backhand loop is more brush loop than a loop drive so I am not sure I can answer that question for you. I was finding getting the timing right was tough but that could just be because I am still knocking the rust of my game having not played for years.